Heartbroken Motherwell manager Mark McGhee could not hide his disappointment after his team went down 2-1 against Rangers at Ibrox to crash out of the William Hill Scottish Cup on Saturday. n The crestfallen gaffer said that the pain of the defeat – losing to two late Kenny Miller goals on 82 and 88 minutes – could only be matched by two agonising English play-off semi-final losses he had suffered earlier in his managerial career when boss of Wolves and Millwall respectively. “I’ve only felt as bad as this twice before in 900 odd games,” McGhee told pressmen immediately after the full-time whistle on Saturday. “I’m really stuck for words. “I couldn’t speak for half an hour. I had no words. A look back at the history books identifies the only other two matches which have caused McGhee so much pain spanning 26 years in the dugout. He was in charge as Wolves were defeated 4-3 on aggregate against Crystal Palace in 1997, having lost two late goals in a 3-1 first leg loss. And he suffered more play-off agony as Millwall lost to a last minute Birmingham City goal to deny them a place in the 2002 final. 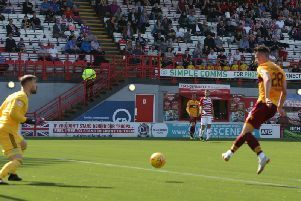 McGhee admitted that he never thought Saturday’s game against Rangers was won, even after Louis Moult had put the visitors ahead with a headed goal after 74 minutes. He said: “We knew that with 10 minutes to go Rangers could come back. McGhee said the manner of the mistakes Motherwell had made at Ibrox in the build-up to Miller’s goals were what disappointed him the most. “The second goal’s ludicrous, you know,” he said. “I’m gobsmacked to be honest. McGhee said that Scott McDonald – on as a second half substitute for Motherwell on Saturday – had not trained at all in the week running up to the Ibrox tie.